The Guild of Jewellery Designers are now pleased to be able to offer, through a partnership with a member of the UKs largest card processing group (by transaction volume), Worldpay, a selection of solutions for taking credit or debit card payments with some exceptionally competitive rates for both free Silver members and Gold members. 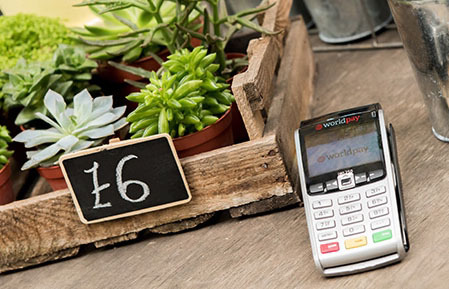 WorldPay have now introduced a 'pay as you go' option on both terminals and online. Transaction rates fixed at between 1.2% -2.25% across the board on all transaction plus a 4p auth fee. No monthly service charge or PCI charge. Next day swap on terminal due to breakage or malfunction. Members keep the terminal for as long as they like in the comfort of knowing that if they don't use it, they will pay nothing in any given month. They have also introduced a 'pay as you go' online option with no upfront cost and no monthly fee or minimum monthly service charge. All the one off upfront cost for the terminal are paid in the following month and not upfront. The money is processed directly into your bank account within two/three working days. The Portable Credit and Debit Card Machine is the ultimate wireless “pay-at-table” payment in a location solution. Our portable option enables you to take payment from your customers within your premises without them having to come to the counter. For “customer not present” card transactions, this portable credit card machine also provides a great option for taking all your telephone and mail order payments from your customers. Ideal for all retail shops, applications like restaurants and transactions where customers are not on the premises – our portable card machine makes payment much more convenient for you and your customers. This fully Chip & PIN compliant and PCI PED certified credit card processing machine provides complete flexibility for the user combined with high security Bluetooth technology, allowing fast online authorisation of all credit and debit card transactions. fitted with a SIM card and a rechargeable battery. 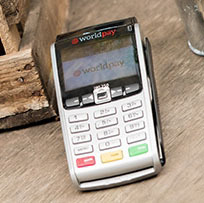 Once the battery is charged, the machine can be used indoors or outdoors to accept card payments. No phone line is required, and the O2 SIM card we use has a 98% UK network coverage. Should you encounter any network coverage issues, we are able to provide coverage from an alternative network instantly. The machines are built to be light and durable. They easily fit into the palm of your hand and are built to be used for events in multiple locations. The typical battery life is 48 hours with moderate usage. The terminal only takes a few hours to recharge fully. When at the office, the machine can be plugged in to a power supply to maintain the battery life. Again, transactions can be processed either face to face or cardholder not present. The online payment page is a payment gateway that allows people to go on to a website and make a payment using their debit and credit card. This payment page can either be integrated into your existing website, or we can “host” the pay page on our website and is easy to use and understand for the customer and yourselves. The user will select to make a payment for a course on the website. Once they do, they will be taken to a payment page headed with your logo and skinned with your colour scheme (Redirected). Alternatively they will be taken to a secure part of your website (Integrated). The payment will be for a fixed amount, as generated by you. They will enter the payment details and the money will be transferred directly to your bank account within 2 – 3 working days. An e-mail receipt will be sent to you to alert you of a new payment. The page is fully secure and encrypted, and compliant with all PSI-DSS regulations. They are also built to handle a large number of transactions, and utilise backup servers, one at either end of the UK to ensure there is never any downtime. Included is a real time management information system that allows you to view all transactions that you receive on your website. The management system will show you the time, date and amount of all transactions. It will show you what the payment is for, and capture the name and contact details of the person who made the payment. This is useful to correlate administration with your clerk. In short, the management system will provide an effective administration tool for tracking payments. Through the management system, you can also access the Virtual Terminal. This is a default page that will allow you to enter card and personal details on behalf of a customer. This is ideal for phone payments or postal payments – you simply enter the details as you take them/read them and process the payment through this page.